Meta.Morf International Art & Technology Biennale, Trondheim NO 2016. We are all Explorer Fish Performed and Produced by Sarah Jane Pell (2016), Filmed by Shaun Wilson, Edited by Jacqui Hocking, Sound design Alister Morley. Ocean Synapse Produced by Sarah Jane Pell and Ben Burke (2014). Compositon Usman Riaz (DVD) Run Time 20:00. The Tailor of Autumn, by Shaun Wilson (2015) Honeyhouse Films, AU. 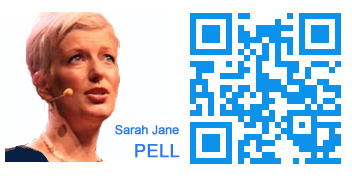 Sarah Jane Pell starring as Aqualias. Pre-Launch to SONY March 2014. ETTAS Space-related Art Showcase, featuring 'Hydrophilia' by Sarah Jane Pell (2012), Produced by the European Space Agency Topical Team Art Science & Liquifer Systems, LLC, Vienna. Edited by Christian Waldvogel. Released 2012. Run time 60:00. Walking with Water featuring seven performance art works of Sarah Jane Pell (2005), Produced by Contemporary Arts Media, Perth/ London, (DVD) Released 2006. Run Time 54 mins. Deeper, Deeper, Deeper by Sarah Jane Pell (2013). Produced by Alister Morley, Staccato Tunes, Melbourne. Perth International Arts Festival (CD) Released 2013. Run Time 60:00. Are you a producer, curator or member of the press? Connect with Sarah on your favorite social networks.